Like I have said before Tomi Ahonen has serious problems with reality when he starts to “prove himself right”. And that was again the case a few days ago when he stated a ban: no talk allowed in blog that iPhone would not be a copy of LG Prada. None. The iPhone was a copy, period. He unfortunately deleted his comment so I can’t quote it but it’s merely continuing old story so let’s use “the old story”. Never mind about the previous one, Tomi has now talked about that again so there is a very fresh statement on the topic. But that ‘iconic’ design of the original iPhone was a blatant copy of a spectacular phone design – from 2006, that won many international industrial design awards in 2006 (also well before the iPhone prototype was even shown by Steve Jobs in public in January 2007) Not invented by Nokia, no. Not even by the clever Japanese. That design form factor of a slim one-button design 3.5 inch touch screen – was invented by LG and they have a chest full of 2006 awards for it. The iPhone? Its looks were not invented by Apple they were – ahem – ‘copied’ from the award-winning LG design from 2006 which was launched as the LG Chocolate and LG Prada before the iPhone was sold, in 2007. But winning international design awards in 2006. So much for ‘Apple’ iconic design. Thank LG for the one-button touch-screen slab phones with large touch-screen that we have today from Androids to Lumias. Apple did not invent this form factor. Apple did what they always do – they steal from the best (like the original Macintosh PC, it didn’t invent the mouse – that was invented by Xerox). This is NOT simultaneous invention in parallel. Apple had its own iPod-phone project that was due to release their first phone in 2006 for the Christmas sales market. Steve Jobs was shown a prototype of that phone in the summer – an evolution of the work Apple did with Motorola on their failed Moto Rokr musicphone. The original Apple concept for what became the iPhone – looked like a Motorola or Nokia phone, with buttons and a modest screen. Steve Jobs said no, killed that project, insisted on a total redesign and gave them one year. That total redesign work started in the summer of 2006 and that is when the LG product was already displayed as a radical design out of South Korea. Then Apple inserted the guts of much of the lame tech they had planned for a 2006 phone (2G radio tech, 2mp camera, etc, all already obsolescent for 2007) and added the glorious LG-designed concept for a radical phone FORM FACTOR. Yes, the date makes it obvious that LG Prada can not be “iPhone clone” (LG Prada was launched earlier and even if it was not, LG did not make that phone in few weeks) But also we have to acknowledge that iPhone cannot be a Prada clone either (as iPhone was not made in few weeks after Prada launch). But then again, Tomi also insists that LG Prada outsold the original iPhone. I’m going to disagree with both Anon and Tomi and argue the iPhone wasn’t a copy of the LG at all. Neither of which the LG had. Those require a very sophisticated and tuned operating system and graphical framework. Moreover what Apple was doing in 2007 simply wasn’t possible at reasonable cost (i.e. a cost that consumers would pay) in 2007. What made it possible for Apple were the enormous subsidies from AT&T. Early iPhone adaptors bought iPhones for much less than cost in exchange for tolerating a hugely oversubscribed data plan. innovation (d) has disappeared now that consumers accept that cellular handsets are $500 items. However (a), (b) and (c) as a package are now so standard it becomes easy to forget how visionary Apple was on this. – Tomi entering and telling that iPhone was a copy of LG Prada, period. He said he will delete all comments ever written from anyone that tries to say otherwise. – Nick “Wayne Brady” said something in the lines of LG Prada and iPhone designs not being the same thing. – Tomi deleted some amount of comments and said he’ll delete all if he does not stop. – Something probably happened here. – Tomi deleted all comments from Wayne Brady, all ever written. And all of his own comments mentioning Wayne Brady, at least for the past few days. It’s quite like Orwell’s 1984, really: He did not only delete Wayne Brady, he deleted also the history where Wayne Brady had existed! 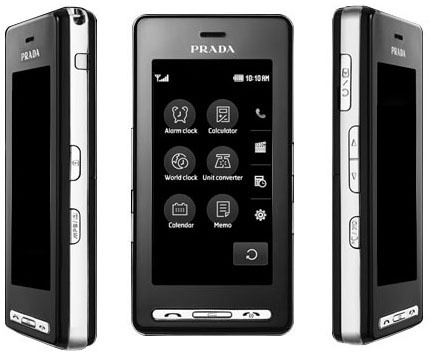 iPhone cannot be a copy of LG Prada. Like I pointed out in this post, Apple was working on touchscreen-only design in 2004 and that work got carried over to what came to be iPhone. Here’s the link again (visit link). The iPhone 2G was not the best phone in the world. Apple has since made 15 major technical improvements to the original, over the past 3 years, and Apple itself has celebrated those 15 changes as radical and important. Nokia’s flagship N95 which was being sold before the iPhone 2G even launched in 2007, had 14 of those 15 technical abilities as standard features. And the N95 had tons more features and abilities that even the latest iPhone 4 does not support. By every reasonable comparison, the N95 was the superior phone in 2007. Except for one very visible drawback – the N95 didn’t have a touch screen. It seems from the short clip on CNBC a moment ago, that this Apple phone does not have a keypad? I am not sure if I saw correctly. If the iPhone does not have a keypad, it may be successful in America, but it will definitely fail in the rest of the world. You cannot send text messages effectively – fast, and secretly – if you have to point at a screen to type. But please, I have not yet seen actual specs on the phone, so this is mere speculation. I do hope that Apple knows the ONLY addictive service on mobile is SMS text messaging. Music is not addictive. If the iPhone is poor at texting, it will fail. Of course, by 2010, everyone with half a brain can see that the end was near. Sure Symbian was still the world’s bestselling mobile operating systems, but the truth was, the Nokia 5230 accounted for nearly 75% of all those sales!